Tinea capitis (ringworm of the scalp), kerion, tinea faciei (face), tinea barbae (barber’s itch, tinea sycosis, ringworm of the beard), tinea corporis (ringworm of the body, tinea circinata, tinea glabrosa), Majocchi granuloma, tinea imbricata, tinea cruris (ringworm of the groin, jock itch), tinea pedis (athlete’s foot), tinea manuum (hands), and tinea unguium (onychomycosis, dermatophyte infection involving nails). Fungal skin infections are categorized into superficial and deep, with superficial infections defined as those limited to the stratum corneum of the epidermis, or to the hair and nails. The three most common types of superficial mycoses are dermatophytosis, diseases caused by Malassezia and superficial candidiasis, while the least common are tinea nigra, black and white piedra, and the infections caused by nondermatophytic molds. This chapter will focus on the superficial dermatophytoses. Superficial fungal infections are some of the most common dermatologic diseases seen worldwide. It is estimated that between 13.8 and 20% of the population has had a dermatophyte infection and approximately 12-13% have onychomycosis. Dermatophytosis is an infection caused by fungi from three genera, namely Microsporum, Trichophyton, and Epidermophyton. Infections caused by these organisms are referred to as tinea which precedes the Latin name for the site which they involve, i.e. 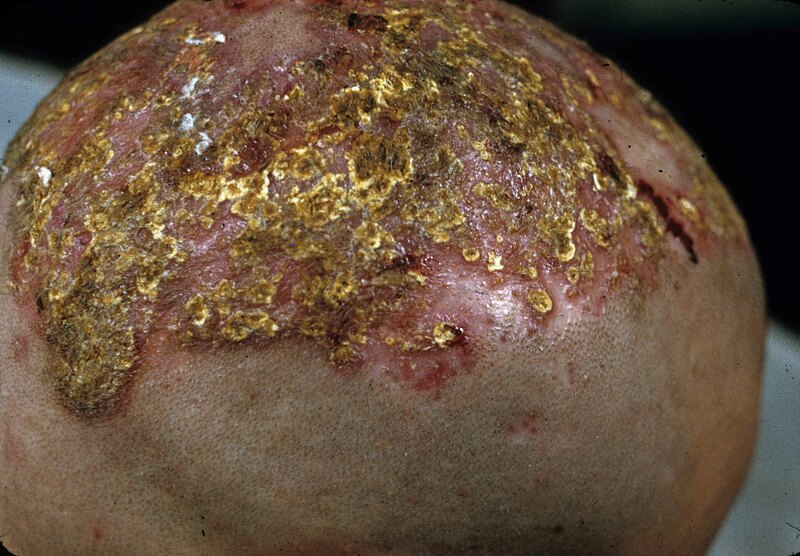 tinea capitis is a dermatophyte infection involving the scalp. The most common system to classify these organisms is based upon mode of transmission; geophilic (found in soil and infect both animals and humans), zoophilic (found on animals, but can be transmitted to humans), and anthropophilic (found on humans). The most common dermatophytes that result in disease in humans are summarized in Table I. What is the best treatment, and methods to prevent spread? The most common antifungal agents are summarized in Table II. Treatment options are summarized in Table III. Key concepts regarding the most common antifungal agents. Suggested systemic treatment regimens for various dermatophytoses. It is important to reduce fomite load by disinfecting hair brushes, cleaning towels, clothing and linen, getting rid of old shoes, vacuuming, and washing the floors. Wearing loose aerated clothing can also be beneficial. Topical therapy is ideal for patients with limited involvement by tinea corporis, cruris, and pedis. Medications should be applied to the lesion and at least 1-2cm beyond this area once or twice a day for at least 1 to 4 weeks, depending on which agent is used. Topical azoles and allylamines show high rates of clinical efficacy. For tinea capitis, antifungal shampoos containing 2% ketoconazole or 2.5 selenium sulfide shold be used in conjunction with oral antifungals and all household contacts should similarly use the shampoo daily. The side effect profile is limited to primary contact dermatitis. Other topical agents that specifically address onychomycosis include ciclopirox olamine 8% and amorolfine 5% nail lacquers (the latter is approved in Europe but not in the USA). Ciclopirox olamine (Penlac, Loprox) is a hydroxypyridone derivative that works differently than other antifungals agents in that it does not affect sterol biosynthesis, instead it chelates polyvalent cations in metal-dependent enzymes that are involved in fungal cell metabolism and growth and result in membrane instability. Ciclopirox has antifungal activity against dermatophytes, yeast and molds. Ciclopirox olamine is applied to affected nails daily and then removed with alcohol weekly for 48 weeks. Although ciclopirox olamine has only approximately a 5.7-8.5% complete cure rate when used alone, when used in conjunction with systemic medication it may improve efficacy and reduce the recurrence rate. Amorolfine is a morpholine topical antifungal that inhibits D14 reductase and D7-D8 isomerase resulting in depletion of ergosterol and ignosterol accumulation in the fungal cytoplasmic cell membranes. Its spectrum of activity includes dermatophytes, and some filamentous fungi and yeasts. Amorolfine is applied once or twice weekly for 6 months and has a slightly greater efficacy with a 12–46% complete cure rate. Efinaconazole (Jublia) 10% nail solution is a broad spectrum (effective against dermatophytes, non-dermatophytes and yeasts) triazole specifically developed to treat onychomycosis due to is good nail penetration. Like other azole antifungals it inhibits lanosterol 14α-demethylase in the ergosterol biosynthetic pathway. When used alone this has an approximate 15.2-17.8 complete cure rate. Tavaborole (Kerydin) 5% is classified as a Oxaborole (a novel, boron-based pharmaceutical agent). It is a broad spectrum anti-fungal which inhibits fungal protein synthesis via forming boron-based bonds at the enzyme-editing site to prevent catalytic turnover of leucyl-tRNA synthetase and block fungal protein synthesis. It has a 6.5-9.1% complete cure rate. Nonprescription agents (Vicks VapoRub, tea tree oil and snakeroot extract) have all also been evaluated in small nonblinded trials, by applying these agents once, and twice daily or every third day respectively for 48 weeks achieving results on par with ciclopirox. More recently various lasers have been used with some success in clinical clearance. Luliconazole (Luzu) 1% cream is another newly approved (November 2013) topical antifungal medication that belongs to the azole class. It inhibits ergosterol synthesis by inhibiting lanosterol demethylase. It was approved for the treatment of interdigital tinea pedis, tinea cruris and tinea corporis caused by Trichophyton rubrum and Epidermophyton floccosum. It is to be applied to the affected area and approximately 1-inch of the immediately surrounding area once a day for 1-2 weeks. Several factors must be considered before starting systemic medications such as the patient’s comorbidities, interactions with diet and other medications, medication adverse side-effects, compliance, and cost. It is important to remember that systemic medications for onychomycosis typically consist of several months of therapy and relapse is not uncommon. The dosage and dosing schedule varies depending upon the study. Although griseofulvin has been used in the past for onychomycosis, it shows limited efficacy and is no longer a recommended therapy. All systemic antifungal agents, except fluconazole, are extensively metabolized in the liver and can have significant drug interactions. Although minimally metabolized, fluconazole is an inhibitor of several cytochrome P450 enzymes, leading to drug interactions. The exact interactions are beyond the scope of this article and have been extensively reviewed. Although fluconazole has better oral bioavailability (90%), as compared to terbinafine (40%) and itraconazole (55%), it is not approved by the US Food and Drug Administration for treatment of dermatophytes and is simply used off label. Since terbinafine has a higher cure rate (70% verses 54%), as compared to itraconazole for the treatment of onychomycosis, and has less safety concerns (less drug interactions, and no black box warning pertaining to risk of cardiovascular problems) currently it is the preferred FDA approved oral therapy for onychomycosis; however, it too has risks and can be associated with serious skin hypersensitivity reactions. Lastly, due to the risk of fatal liver injury and adrenal gland insufficiency the FDA changed its boxed warning for oral ketoconazole and recommends it only be used in certain life-threating systemic mycoses when alternative therapy has failed, is unavailable or not tolerated. Although it has been used in the past as a one-time dose to treat tinea versicolor, this is no longer recommended. Systemic therapy may be indicated for extensive tinea corporis, patients who have shown resistance to topical antifungal agents, infections that arise in association with immunosuppression, or for patients who have tinea capitis, Majocchi granuloma, or tinea unguium. Use of oral agents requires attention to potential drug interactions and monitoring for adverse effects. Low potency topical corticosteroid can be added to the topical antifungal regimen to provide rapid relief from the inflammatory component of the infection, but the steroid should only be applied for the first few days of treatment. Use of combined corticosteroid and antifungal agents is not advised, since patients tend to continue this medication for the entire course of treatment and prolonged use of steroids can lead to persistent and recurrent infections (tinea incognito), longer duration of treatment regimens, and adverse side effects such as skin atrophy, striae, and telangiectasias. The incidence of infection tends to change with age, geographic location, and climate. Dermatophytes grow best in warm and humid environments, and are more common in tropical and subtropical regions. Some dermatophytes are geographically restricted: for example T. concentricum is only seen in indigenous populations of certain islands in the South Pacific and in some areas of South America; whereas T. mentagrophytes var. erinacei is limited to France, Great Britain, Italy, and New Zealand; and M. audouinii is found primarily in Europe. On the other hand, M. canis, M. nanum, T. mentagrophytes, T. verrucosum, and T. equinum occur worldwide. Infections are most common in postpubertal hosts, except for tinea capitis which is more common in children with an incubation period of typically 1 to 3 weeks. Although both genders are affected there is a slight male predilection. Predisposing factors include household exposure to an infected family member, immunosuppression, genetic susceptibility, diabetes mellitus, palmoplantar keratoderma, ichthyosis, and atopy. Human immunodeficiency virus (HIV) infection in and of itself has not been found to increase the susceptibility to dermatophyte infection, but there may be a greater likelihood for recurrence and chronicity, as well as atypical presentation or more extensive infection. Dermatophytes invade keratinized tissue via their ability to produce keratinases. Mannans in the cell wall of the fungi inhibit the host’s immune response, which explains why most anthropophilic fungi elicit very little inflammation. Furthermore, mannans are taken up by the keratinocytes, resulting in decreased cell turnover, which decreases the likelihood of the fungus being sloughed off. This could explain why some people have chronic infections. Infection occurs by direct contact with arthrospores (asexual spores formed in the hyphae) on infected hosts or from indirect contact with conidia (sexual or asexual spores) found in the environment or on fomites (infected exfoliated skin in clothing, brushes, towels, rugs, shoes, etc). Infective elements can remain viable in the environment for months to years depending on the species. The host has innate defenses against dermatophytes including activation of complement via the alternative pathway which results in inhibition of fungal growth. Additionally polymorphonuclear leukocytes can damage or kill fungi. The development of cell-mediated immunity correlates with delayed hypersensitivity, and the inflammatory response results in clinical cure. In contrast, the lack of or a defective cell-mediated immunity predisposes the host to chronic or recurrent dermatophyte infection. The clinical presentation is variable depending upon several factors, including the site of infection, the species of the fungus, the host’s response and the immunological status of the patient. If a patient is treated erroneously with topical steroids or immunomodulators, such as tacrolimus, the clinical presentation is modified. This variant is referred to tinea incognito. The lesions become less erythematous and annular and are usually without scale. The plaques tend to be more extensive; less defined and often contain pustules and papules. This is most common in children after the first year of life, but can be seen in adults (Figure 1). Primary culprits in the past were M. canis and M. audouini, both of which colonize and destroy the outside of the hair shaft (ectothrix) and could be identified by their fluorescence under a Wood lamp. 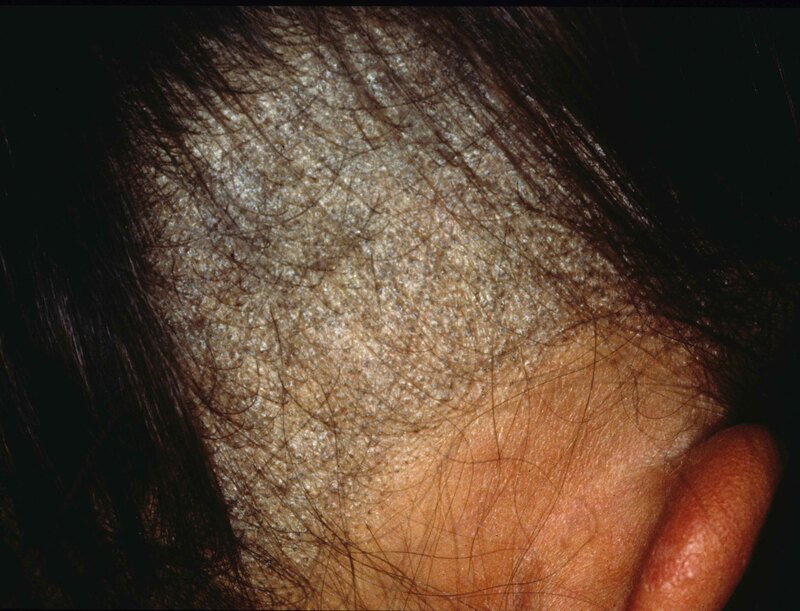 Clinically they presented as dry scaly patches of alopecia with broken hairs and referred to as “gray patch” tinea capitis. In Europe, M. audouini is reappearing. Currently the most common organisms in the United States are T. tonsurans and T. violaceum which are found inside the hair shaft (endothrix) and do not fluoresce. Since hairs often break close to the scalp these are referred to as “black dot” tinea capitis. Tinea capitis is often associated with posterior cervical and auricular lymphadenopathy. The differential diagnosis includes seborrheic dermatitis and bacterial infections. This is the most severe form of tinea capitis and is caused by T. schoenleinii (Figure 2). It is a chronic scalp infection typically seen in children in developing countries. It presents as thick yellow crust (scutula) on an erythematous base associated with scarring alopecia. Organisms and air spaces can be seen within the hair shaft, and with Wood lamp the hair has bluish-white fluorescence. This is a regional form of tinea corporis that involves the face, but not the bearded area (Figure 3). The primary lesions resemble those on the body presenting as plaques that have an annular configuration with scale or pustules at the border. However, steroids are often used and therefore the lesions can appear less defined and can contain papules and pustules presenting as tinea incognito. The differential diagnosis includes seborrheic dermatitis, contact dermatitis, acne vulgaris, perioral dermatitis, and rosacea. This is typically seen in postpubertal males and involves the bearded region of the face and neck (Figure 4). Tinea barbae is most often caused by zoophilic dermatophytes: T. verrucosum or T. mentagrophytes var. mentagrophytes, and lesions are more inflammatory. The condition is commonly acquired through contact with infected animals and can be spread through use of contaminated razors. The patient typically presents with erythematous plaques studded with pustules pierced by terminal hairs. Abscesses, sinus tracks and bacterial superinfection are not uncommon and the patient may have malaise, fever, and lymphadenopathy. When the infection is caused by T. rubrum the lesions tend to be more superficial and less inflammatory. The patient may experience alopecia which can be permanent in the more inflammatory forms of the condition. This is a dermatophyte infection that occurs on the exposed glabrous skin of the trunk and extremities (Figure 5). The most common organisms that cause tinea corporis worldwide are T. rubrum, followed by T. mentagrophytes. Although anyone can become infected, those who have close contact with other people (military housing, contact sports, locker rooms) and those who are immunosuppressed are more predisposed. Domestic animals are an important source of transmission. Infections also can be transmitted from human to human, especially from those who have tinea capitis or pedis, or from the soil. Classically, the lesions appear as erythematous, annular to serpiginous, centrifugally growing plaques that have peripheral scale and central clearing. Sometimes the lesions, especially those caused by zoophilic dermatophytes, can have a pustular or vesicular active border. This is a dermatophyte infection that involves the inguinal region and often spreads to buttocks, waist, and thighs, but spares the scrotum (Figure 6). The most common organisms are T. rubrum, T. mentagrophytes, and E. floccosum. This condition is most frequently seen in men since the scrotum encourages a moist warm environment which allows for fungal growth. Lesions can be unilateral or bilateral and are characterized by sharply demarked erythematous plaques with a scaling advancing border, but can sometimes contain pustules. If the scrotum is involved or if there are satellite lesions, cutaneous candidiasis should be considered. The differential diagnosis also includes intertrigo, erythrasma and contact dermatitis. 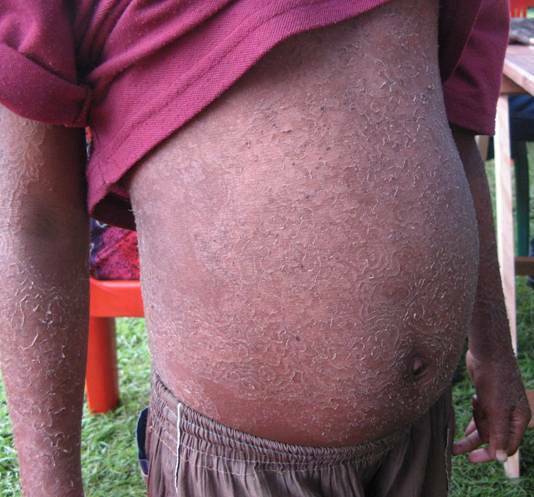 This is a variant of tinea corporis that is geographically restricted to the indigenous people of some South Pacific islands and some areas of South America (Figure 7). The condition is caused by T. concentricum and is characterized by extensive concentric rings of scale. In the United States this is the most common superficial fungal infection in adults and is often chronic (Figure 8). Infections are most often caused by T. rubrum, but can also be caused by T. mentagrophytes, E. floccosum, and T. Tonsurans (children). When the feet are involved it typically presents as either a macerated interdigital infection (most common) or as diffuse scaly thicken plaques on the plantar surface of the foot in which case it is referred to as “moccasin sandal.” This latter infection is often chronic and difficult to cure. Variable erythema or even vesicles can also be seen. Tinea manuum typically presents similar to the diffuse form on the foot; however, lesions are most often only on one hand and are associated with bilateral foot involvement, resulting in the “two feet-one hand syndrome.” The nails may also be involved. Bacterial superinfection and cellulitis can complicate the infection. The differential diagnosis includes dyshidrotic dermatitis, contact dermatitis, psoriasis, and bacterial infections. This is the most common affliction of the nails seen in dermatology (Figure 9). Onychomycosis of the toenails occurs significantly more frequently than infections of the fingernails. One, several or all nails can be affected. Predisposing factors include occlusive footwear; humidity and moist feet; repeated nail trauma; a genetic predisposition; and concurrent diseases such as diabetes, peripheral vascular disease, and immunosuppression. The incidence ranges from 3 to 13% depending on the population studied and increases with age. There are four subtypes of onychomycosis depending upon which part of the nail is infected. Approximately 60% of cases of onychomycoses are caused by T. rubrum, 20% by T. mentagrophytes, and 10% by E. floccosum. In cases of superficial white onychomycosis, T. mentagrophytes can be cultured in the majority of cases. Onychomycosis can also be caused by yeasts and nondermatophyte molds such as Scopulariopsis and Scytalidium, as well as Aspergillus, Acremonium, and Fusarium; however, this is seen in less than 10% of infections. Distal subungual onychomycosis affects the nail bed, plate, and hyponychium. The nail is often thickened, yellowish-brown, and associated with subungual debris. Distal lateral onychomycosis is similar to distal subungual, but occurs as a result of extension of tinea pedis onto the lateral cuticle. Proximal subungual onychomycosis occurs when the fungus invaded through the proximal cuticle. Clinically the nail has a whitish appearance and is more commonly seen in people who have HIV or other types of immunosuppression. Superficial white onychomycosis is an uncommon form of onychomycosis and presents as a white chalky nail. Differential diagnosis of tinea corporis includes: other dermatologic conditions that can assume an annular appearance such a nummular eczema, urticaria, pityriasis rosea, erythema chronicum migrans, erythema multiforme, erythema annulare centrifugum, polymorphous light eruption, subacute cutaneous lupus erythematosus, granuloma annulare, sarcoidosis, and Hansen disease. Nummular eczema presents as one to several pruritic erythematous coin shaped plaques. It is most often seen on the distal extremities of males and can be associated with xerosis. Over time the lesions may centrally clear or become scaly. Lesions can also become lichenified or contain pustules. Urticaria is a common condition that presents as evanescent annular to serpiginous plaques that have an erythematous raised border and blanched center and are without scale. Onset of lesions is typically associated with new drug exposure, foods, or recent illness. Pityriasis rosea is characterized by small fawn-colored lesions distributed along the cleave lines in a Christmas tree distribution. The condition is self-limited and believed to have a viral etiology. Erythema chronicum migrans represents the hallmark lesion of Lyme disease and presents as a centrifugally expanding erythematous plaque with central clearing. One or several lesions can be present. Erythema multiforme is a cell-mediated response, most often to herpes simplex. It presents as multiple targetoid lesions frequently with an acral distribution. Erythema annulare centrifugum is believed to represent a hypersensitivity condition and presents as annular erythematous plaques with a trailing scale. Lesions are most commonly located on the trunk, buttocks, and thighs. Polymorphous light eruption is a common acquired idiopathic photodermatosis characterized by recurrent erythematous papules, papulovesicles, and plaques located on sun-exposed surfaces in fair-skinned females. Subacute cutaneous lupus erythematosus presents as annular, arcuate, or papular lesions most commonly in sun-exposed areas. Approximately 50% of patients will meet the criteria for systemic lupus erythematosus and present with arthralgias, low grade fever, malaise, or myalgias. Granuloma annulare is an idiopathic granulomatous condition that typically presents as nonscaly, annular plaques with indurated borders on the distal extremities. Sarcoidosis is another idiopathic granulomatous condition that present as annular, indurated plaques. The lesions can be associated with lung disease or asymptomatic hilar lymphadenopathy. Hansen disease (leprosy) is an uncommon condition in the United States outside of endemic regions. The disease is caused by Mycobacterium leprae. It has a varied clinical presentation depending upon the host’s immune response. In patients with a good immune response lesions are often few and present as annular, sharply demarcated, and erythematous to hypopigmented plaques. The lesions are often associated with scaling, alopecia, and anesthesia. Patients who have defective cellular immunity have more numerous lesions that are less well defined and can be macular or papular. The differential diagnosis of onychomycosis includes psoriasis, lichen planus, chronic nail injury, and certain genodermatoses. An inflammatory form of tinea capitis which occurs as a result of advanced disease coupled with an exaggerated inflammatory response. Lesions present as indurated boggy plaques containing perifollicular abscesses associated with localized alopecia. Posterior cervical and auricular lymphadenopathy and even systemic illness can occur in conjunction with this infection. Deep variant of tinea corporis where there is follicular involvement. 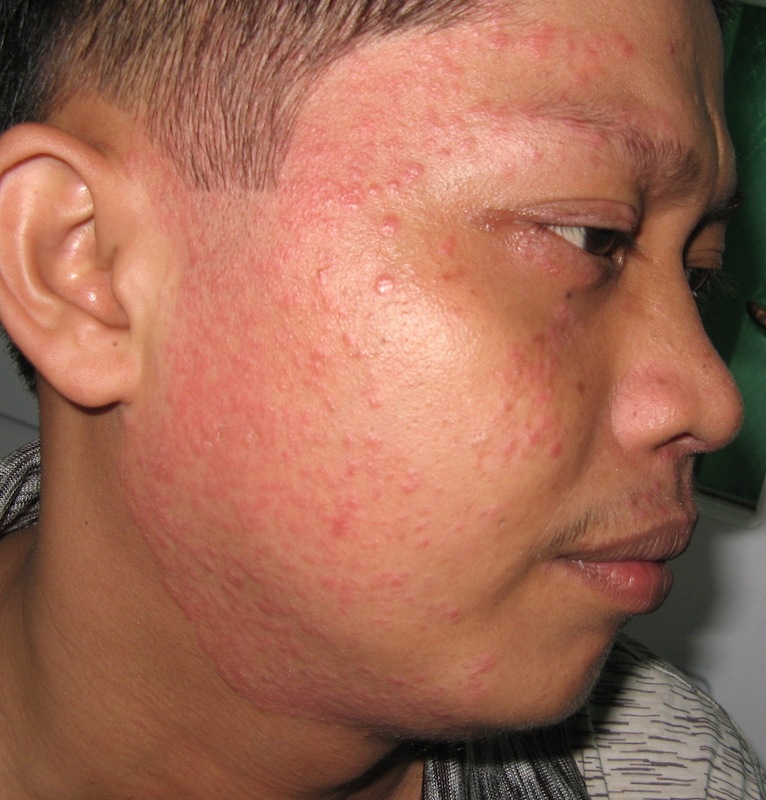 Clinically presents as boggy, indurated papules and plaques that may drain purulent material. The lesions are characterized histologically by a suppurative granulomatous folliculitis. This is a variant of tinea corporis associated with an excessive inflammatory response which can have a granulomatous or verrucous appearance. Rapid in-office testing can be done by scraping the skin or obtaining a nail or hair sample. Potassium hydroxide (KOH) will show hyphae interspersed among the epithelial cells, or within or on the hair shaft. Trichophyton tonsurans, the most common agent of tinea capitis, can be seen as solidly packed arthrospores within the broken hair shafts scraped from the plugged black dots of the scalp. The use of dimethyl sulfoxide (DMSO) with KOH accelerates dissolution of the keratin and addition of Parker blue ink or chlorazol black makes identification of the hyphae easier. Fungal culture is used for positive identification of the species. Usually fungal growth is noted in 5 to 14 days, but usually takes 4 to 5 weeks for species identification. Dermatophyte Test Medium (DTM) is an alternative to traditional cultures. It allows identification of the presence of dermatophytes, via a simple color change from yellow to bright red due to production of alkaline metabolites, without having to look at the colony, the hyphae, or macroconidia. However, this medium does not allow identification of the species of dermatophyte. The color change should occur in 3 to 7 days; after that time, a color change is most likely due to a contaminant. If direct microscopic examination with KOH and cultures are negative, a biopsy can be performed. Organisms are best visualized in the stratum corneum, nail, or hair utilizing the periodic acid Schiff (PAS) or Gomori methenamine silver (GMS) stain; but the species of the fungus cannot be determined. Histopathology provides a quick and reliable method for identification of a dermatophyte infection with a sensitivity of approximately 81% compared with culture, which is approximately 53%. A PAS stain is considered more sensitive than fungal cultures for the diagnosis of onychomycosis. One study showed that GMS is superior to PAS staining, but other studies refuted this and concluded that PAS is significantly cheaper and should be the preferred stain. Although new techniques have been developed using molecular genetics tools specifically restriction fragment length polymorphisms and more recently polymerase chain reaction assays to diagnose dermatophyte infections they are not widely available and can be cumbersome. The emergence of resistant fungal strains has highlighted the need for in vitro susceptibility-resistance testing. The E test® (AB Biodisk, Solna, Sweden) is a patented commercial method that quantitatively determines antimicrobial drug minimal inhibitory concentration by providing a quicker, less labor intensive test as compared with the traditional agar dilution method. The test is set up similar to an agar disc diffusion test, but the disc is replaced with a calibrated plastic strip that is impregnated with a continuous concentration gradient of drug. Zane, LT, Chanda, S, Coronado, D, Del Rosso, J.. “Antifungal agents for onychomycosis: new treatment strategies to improve safety”. Dermatol Online J.. vol. 22. 2016 March 16. Gupta, AK, Daigle, D, Foley, KA.. “Topical therapy for toenail onychomycosis: an evidence-based review”. Am J Clin Dermatol.. vol. 15. 2014 Dec. pp. 489-502. Gupta, AK, Daigle, D, Paquet, M.. “Therapies for onychomycosis a systematic review and network meta-analysis of mycological cure”. J Am Podiatr Med Assoc.. vol. 105. 2015 Jul. pp. 357-66. Del Rosso, JQ.. “The role of topical antifungal therapy for onychomycosis and the emergence of newer agents”. J Clin Aesthet Dermatol.. vol. 7. 2014 Jul. pp. 10-8. Westerberg, DP, Voyack, MJ.. “Onycomycosis: Current Trends in Diagnosis and treatment”. Am Fam Physician.. vol. 88. 2013. pp. 762-770. Derby, R, Rohal, P, Jackson, C, Beutler, A, Olsen, C.. “Novel treatment of onychomycosis using over-the-counter mentholated ointment: a clinical case series”. J Am Board Fam Med.. vol. 24. 2011. pp. 69-74. Landsman, AS, Robbins, AH, Angelini, PF. “Treatment of mild, moderate, and severe onychomycosis using 870- and 930-nm light exposure”. J Am Podiatr Med Assoc.. vol. 100. 2010. pp. 166-177. Chang, CH, Young-Xu, Y, Kurth, T, Orav, JE, Chan, AK.. “The safety of oral antifungal treatments for superficial dermatophytosis and onychomycosis: a meta-analysis”. Am J Med. vol. 120. 2007. pp. 791-8. Gupta, AK., Wolverton, S.. “Systemic antifungal agents”. Comprehensive Dermatologic drug therapy. 2007. pp. 75-100. Smith, EB.. “The treatment of dermatophytosis: safety considerations”. J Am Acad Dermatol. vol. 43. 2000. pp. S113-19. Rand, S.. “Overview: the treatment of dermatophytosis”. J Am Acad Dermatol. vol. 43. 2000. pp. 104-12. Silm, H, Karelson, M.. “Terbinafine: efficacy and tolerability in young children with tinea capitis due to “. J Eur Acad Dermatol Venereol. vol. 16. 2002. pp. 228-30. Baran, R, Kaoukhov, A.. “Topical antifungal drugs for the treatment of onychomycosis: an overview of current strategies for monotherapy and combination therapy”. J Eur Acad Dermatol Venereol. vol. 19. 2005. pp. 21-9. Gupta, AK, Fleckman, P, Baran, R.. “Ciclopirox nail lacquer topical solution 8% in the treatment of toenail onychomycosis”. J Am Acad Dermatol. vol. 43. 2000. pp. S70-80. Fitzpatrick, JE., James, WD. “Superficial Fungal skin diseases”. Textbook of Military Medicine. Part III, Disease and the environment. 1994. pp. 423-51. Sobera, JO, Elewski, BE., Bolognia, JL, Jorizzo, JL, Rapini, RP. “Fungal diseases”. Dermatology. 2003. pp. 1171-85. Rodwell, GE, Bayles, CL, Towersey, L, Aly, R.. “The prevalence of dermatophyte infection in patients infected with human immunodeficiency virus”. Int J Dermatol. vol. 47. 2008. pp. 339-43. Dahl, MV.. “Dermatophytosis and the immune response”. J Am Acad Dermatol.. vol. 31. 1994. pp. S34-41. Hay, RJ.. “Tinea imbricata. The factors affecting persistent dermatophytosis”. Int J Dermatol. vol. 24. 1985. pp. 562-4. Elewski, BE.. “Tinea capitis: a current perspective”. J Am Acad Dermatol. vol. 42. 2000. pp. 1-20. Satter, EK.. “Tina imbricata”. Cutis. vol. 83. 2009. pp. 188-91. Welsh, O, Vera-Cabrera, L, Welsh, E.. “Onychomycosis”. Clin Dermatol. vol. 28. 2010. pp. 151-9. Effendy, I, Lecha, M, Feuilhade de Chauvin, M, Di Chiacchio, N, Baran, R.. “Epidemiology and clinical classification of onychomycosis”. J Eur Acad Dermatol Venereol. vol. 19. 2005. pp. 8-12. Karimzadegan-Nia, M, Mir-Amin-Mohammadi, A, Bouzari, N, Firooz, A.. “Comparison of direct smear, culture and histology for the diagnosis of onychomycosis”. Australas J Dermatol. vol. 48. 2007. pp. 18-21. D’Hue, Z, Perkins, S, Billings, SD.. “GMS is superior to PAS for diagnosis of onychomycosis”. J Cutan Pathol. vol. 35. 2008. pp. 745-7. Barak, O, Asarch, A, Horn, T.. “PAS is optimal for diagnosing onychomycosis”. J Cutan Pathol. vol. 37. 2010. pp. 1038-40. Fernández-Torres, B, Carrillo-Muñoz, A, Ortoneda, M, Pujolz, I, Pastor, FJ, Guarro, J.. “Interlaboratory evaluation of the Etest for antifungal susceptibility testing of dermatophytes”. Med Mycol. vol. 41. 2003. pp. 125-30.
da Silva Barros, ME, de Assis Santos, D, Soares Hamdan, J.. “Antifungal susceptibility testing of by E-test”. Arch Dermatol Res. vol. 299. 2007. pp. 107-9. Ghannoum, MA, Isham, NC, Chand, DV.. “Susceptibility testing of dermatophytes”. Curr Fungal Infect Rep. vol. 3. 2009. pp. 142-6. “Guidelines of care for superficial mycotic infections of the skin: onychomycosis”. J Am Acad Dermatol.. vol. 34. 1996 Jan. pp. 116-21. Roberts, DT, Taylor, WD, Boyle, J.. “Guidelines for treatment of onychomycosis”. Br J Dermatol.. vol. 148. 2003 Mar. pp. 402-10.